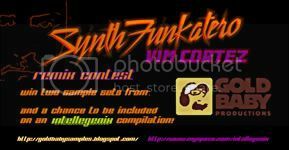 Vim Cortez is running a remix contest, giving the chance to win some prizes. You have to remix the track “Givin’it Up” from his SynthFunkatero EP. Good luck! emix “Givin’it Up” from the SynthFunkatero EP for a chance to win two sample sets from GoldBaby Productions, and a free copy of the SynthFunkatero EP (mp3 dowload)!GoldBaby is an up and coming samples publisher which has garnered a lot of respect from beatmakers around the globe for the quality and authenticity of their products. Vintage drum machines recorded to tape with the best vintage equipment? That’s GoldBaby’s playground. Check them out! Additionally the best remix might be included in a remix compilation on the Intellegenix label! Intellegenix is a Canadian label that releases club and electronic music. They are present on all the major online music stores: iTunes, Juno, Amazon, Beatport, etc.